Do you take supplements and wonder what are they really doing for you? Or, what about when the latest research hits the morning news and you hear that you should suddenly stop taking a supplement that just last week the reports said you shouldn’t live without? Confusing, right? I know. I used to feel the same way. But, if you’ve visited my story page, you know that I experienced firsthand the difference high quality nutritional supplements can make. You can increase your energy, strengthen your immune system, balance your hormones and simply feel amazing with the right supplements. And taking vitamin supplements is no longer optional. Through no fault of your own, no matter how well you eat, you simply cannot get all your necessary nutrients only from the food you eat. But where do you begin? How do you know what your body really needs? How do you know a good quality product when you see it? More importantly, how can you be sure the products you find at the health food store or on line are safe? Below are the latest generations of the products that changed my life 25 years ago. They are still the foundation of my daily regimen. Schedule your free one hour “It’s All About YOU” call today to find out how the right supplements can change you life. Give your body the essential nutrition it needs every day. 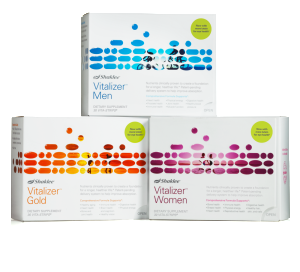 Vitalizer is supplementation made simple. An entire day’s nutrition packed into a convenient, everyday, go-anywhere Vita-Strip. We’re all the run these days with busy lifestyles and it’s all too easy to forget our vitamins. This handy little strip goes right into your purse or pocket so you are never without them. Protein is an essential building block of health, and it boosts energy and wards of hunger. Life Shake is my go to morning shake. Its 24 grams of protein fuels me for day, helps me maintain a healthy weight, and is packed with fiber and probiotics to support immune and digestive health. 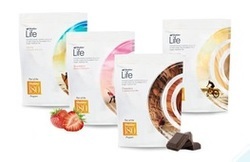 All these great nutrients are delivered sans gluten, lactose, artificial sweeteners, preservatives, and flavors. All the nutrients your skin craves in one system. You may be wondering what skin care has to do with living a health vibrant life. My answer to you is “lots”! Let’s be honest, doesn’t what you see in the mirror each morning impact how you feel about yourself, at least a little? It sure does with me. Don’t get me wrong, my self esteem can certainly stand up to a bad hair day or a blemish on my face. Just the same, I like to look my best. Don’t you? And even more important to good health, did you know that whatever you put on your skin gets absorbed into your blood stream? Why slather yourself with harmful chemicals and artificial ingredients? You can make a different choice and go with products that are natural and plant based.